Pet Care Antifreeze Toxicity Antifreeze Toxicity is danger for your dog Antifreeze Toxicity - The Cure Is A Good Stiff Drink! Antifreeze Toxicity - The Cure Is A Good Stiff Drink! 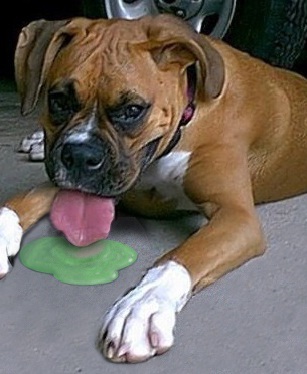 Antifreeze poisoning is extremely common in dogs and other small animals due to its sweet taste and widespread availability to animals, whether in garages, carports, or puddles. Unfortunately the knowledge of the dangers of antifreeze to pets is not widespread, and thousands of animals die every year from ingesting it. Antifreeze poisoning affects the brain, liver, and kidneys, although death most often results from renal failure within days. The toxic ingredient in antifreeze is ethylene glycol, an ingredient also found in hydraulic brake fluid. Antifreeze has extremely high concentrations of ethylene glycol, up to 95% in most cases. Furthermore, ethylene glycol is so toxic that it takes just a couple of tablespoon’s worth to fatally poison a dog. Apparently this “hair of the dog” (no pun intended) treatment is rare, but effective because the alcohol stops a chemical reaction in the poisoning victim’s body. The vodka was administered in the hope that it would, in effect, mop up some of the ethylene glycol in Cleo’s system. Alcohol can actually keep ethylene glycol from being metabolized into toxic chemicals within the body, which allows it to eliminate the poison through its own waste systems. Her vet said that without the vodka treatment, Cleo would most likely have developed kidney failure and died. Without any ethanol, which is the preferred treatment for antifreeze poisoning, the vodka was the only antidote available to save Cleo’s life. The treatment was not cheap, costing the owner more than $2100, plus, we can assume, the cost to replace the vodka which had been a Christmas gift to the veterinarian. It was money well spent. After her four day stay in the hospital, Cleo has made a full recovery and her owner reports that she is a very happy puppy. She is certainly lucky, thanks to the observational skills of her owner and the quick thinking of the veterinarian on duty. Susan Wright DMV is a vet,, a wireless dog fence specialist and writer. Susan enjoys writing articles to share her knowledge to help dog owners learn to provide special care to rescued pets.